Oklahoma only became part of the United States in 1907, but that doesn’t mean it’s without history. The Chisolm Trail went through the state and the Trail of Tears ended in Eastern Oklahoma. Here are some of the most famous historical sites you should take time to visit. 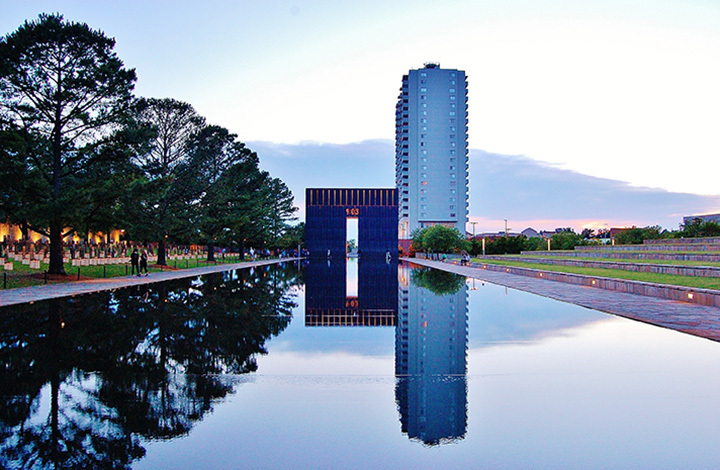 The National Memorial for the Murrah bombing might be one of the most recent events, but it’s also one of the most notable ones. The museum features a lot of information on the response that captivated the entire country, but the outside memorial is something everyone should visit to truly understand the impact the bombing had on the state. This church is considered one of the finest examples of Art Deco architecture in the United States. In 1999, it was designated a National Historic Landmark. Tours are offered following the 11 a.m. Sunday service or by making an appointment with the church office. Price Tower is another fine example of architecture in the state. It’s the only realized skyscraper designed by Floyd Lloyd Wright. Today, the building houses an inn on the top floors and an art museum on the first and second floors. Sequoyah is known for creating a system of writing for the Cherokee language. This cabin was made a National Historic Landmark in 1965, and it’s furnished much like it would have been when Sequoyah lived there. Oklahoma City might be the capital of the state today, but there was once hope that Kingfisher would take the honor. Abraham Jefferson Seay served as the 3rd Territorial Governor of Oklahoma Territory in the mid-1890s. This three-story mansion hosted dignitaries who came to Oklahoma for a Land Run. Experience the early-day life of the pioneers who came to Oklahoma to settle in the late 19th and early 20th centuries. The main exhibit is an original sod house with artifacts that a family might have actually used. The museum grounds include more exhibits that give you an idea of the past. In his 26-year movie career, Tom Mix made 336 feature films, wrote 71 and directed 117. He was known for quick action movies, and he and his horse performed their own daredevil stunts. He never used fake scenes or trick shots in his movies, and he was a pioneer in the industry. This museum houses exhibits from his personal collection. Pawnee Bill is best remembered for his Wild West Show. He was a great entertainer who took the traditions of the cowboys and ranchers and turned them into a show for everyone. The grounds of the museum include his dream mansion, a blacksmith shop, a log cabin and an Indian Flower Shrine. The city of Guthrie was developed in the hours following the April 1889 Land Run. It was designated the territorial capital, then the official state capital in 1907. Legend says that the seal was stolen to make Oklahoma City the capital a few years later, but a special election was held and the voters approved the change. Today, over 1,400 acres of city property are protected as a National Historic landmark because of the architecture and heritage to the state. The round barn is thought to be the only truly round barn in the United States. The details of the architecture and engineering are admired by every visitor to the barn that sit on historic Route 66. It’s a unique landmark built in 1898 and saved from ruin in 1988 by locals who wanted to protect this site. Lt. Col. George Custer led the cavalry on a dawn attack against the Cheyenne. At the time, the land was not a reservation. The cavalry captures 875 Indian ponies, and killed 650 of them to force the Cheyenne back to the reservation. According to records, the tribe lost 60 men. Custer lost 22 of his men in the skirmish. One of the attractions at this site is the Cherokee National Citizen's Cemetery which dates back to pre-Civil War days. Cherokee Bill is buried here. The Fort is a National Historic Landmark, and offers a reconstructed log fort and some of the original buildings of this post. Spiro Mounds is a prehistoric Native American archaeological site open to the public. It’s thought to be one of the most important sites in the nation, due to the number of artifacts dug from the mound. It’s also one of the first major cultural centers before the United States became a nation. Waite Phillips built this service station that now houses a museum featuring the history of Sapulpa, once called the “Crossroads of America” because it was at the intersection of Route 66 and U.S. Highway 75. Philips was an oilman and philanthropist who left a great deal of his fortune to serve the Tulsa community. Boise City is the only town in the continental United States to be bombed from an airplane during World War II. Fortunately, only practice bombs were being used and the town square was deserted when the bombs were dropped. No one was injured, but buildings were damaged. View more Oklahoma Historical Sites.